When is Madden 18 Released? The long-awaited Madden 18 finally has a firm release date of 25th August 2017. And there is a great deal of hype around what can be expected with the release. With the promise of improved graphics, upgrades in gaming and improvements in features, there is a lot of anticipation surrounding the release. While the release date is always on a Tuesday in August, this year the release will be on a Friday for the Madden 18 G.O.A.T. version, a deviation from the typical Tuesday release. If you want to stick with only the standard version, you’ll have to wait for the typical Tuesday release following August 25th. The new Madden 18 has made NFL news, with several new features, upgrades, and improvements over Madden 17. By far, the biggest upgrade from Madden 17 to Madden 18 is the switch over to the Frostbite game engine, which means specific upgrades and improvements in gaming. You can anticipate updated gameplay options as well as notably improved graphics. There is also a teaser floating around that includes the potential for a story mode. EA Sports has historically done really well with this feature in other games, so gamers are holding up hope that the feature doesn’t disappoint in Madden 18. 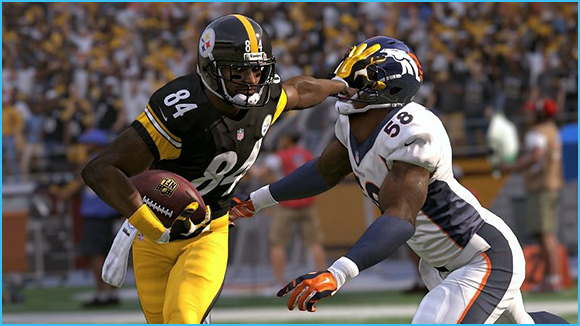 Madden 18 offers a couple of different matchup opportunities, which bears a lot of similarity with EA Sports Madden Ultimate Team, for which gamers buy madden mobile coins. With Madden 18, you will be able to play with your favorite team or you can choose to play the best weekly match-ups which include the latest rosters. Official NFL stats are available as well as custom commentary. One of the new features with Madden 18 is that there are three choices of play styles from which you can choose. It hasn’t yet been announced what those play styles are specifically but the assumption is that they will have something to do with improving play calling by the coach. Another new feature of Madden 18 includes upgrades in passing on the field. You are now able to use target passing which means that there is a new capability to pass to any specified place or player on the field. This means there is no need to only pass to a wide open receiver. Instead, you can pass to anywhere on the field. The switch to Frostbite brings a great deal of anticipation when it comes to improved gaming graphics. This engine is used elsewhere and produces better field gameplay as well as off the field moments, producing more of a story line for the gamer when compared to Madden 17. The cinematic footage that has been released so far looks great but there hasn’t been any pre-release of actual gameplay of Madden 18 just yet. There are likely to be coaching assignments as well coverage adjustments in Madden 18, which most gamers believe to be far overdue. Coaching adjustments might mean being able to make situational changes. As always, EA is likely to continue to cultivate and invest in MUT if for no other reason than because the buying and selling of MUT coins has proven to be incredibly profitable for EA. The commitment to EA Sports Madden Ultimate Team or MUT coins selling doesn’t seem to be fading any time soon. Hiring for testers for Madden 18 is currently underway, with EA Sports Studio looking for testers who can check the game, along with the improved features and graphics, while also keeping a specific eye out for NFL accuracy. Much of the buzz around release of Madden NFL 18 revolved around the always anticipated reveal of the game cover’s athlete. There was much speculation around who would be on the cover for Madden 18 but few speculations were accurate. This year the game cover athlete is Tom Brady, arguably the greatest player of all time, who walked away from the 2017 NFL season with his fifth superbowl win. He is the most decorated and accomplished NFL quarterback of all time, often making NFL news both off and on the field. Brady, the oldest player to ever grace the cover of Madden 18, has publicly stated that he isn’t worried about the Madden curse. If you want to play Madden 18 earlier than the official release date, you’ll be able to via EA Access but not through your own PS4 or Xbox. And if using EA Access, you can expect to play up to five 5 days before the official release on 25th August. 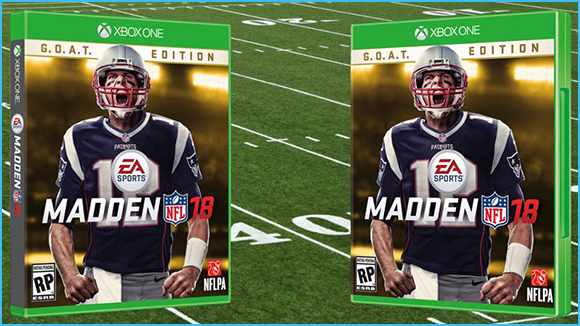 In addition, if Madden 18 G.O.A.T is the version purchased, game play can start three days early on PS4 or Xbox One. Madden 18 is available for gaming with Xbox 360, PS3, PS4, Xbox One, and Mobile. Madden coins, including Madden mobile coins, can be used with each gaming system. The 2017 NFL Draft starts today and, alongside this, there are many reasons why you should be playing Madden Mobile in particular! Madden Mobile are bringing in the Class of 2017 with an awesome line up of events, including (but not limited to) putting the Top 10 Picks straight in the game in real-time as they get drafted through new Live Events, Sets and Packs. On the night of the Draft itself even, the Top 10 picks will be placed right in Madden Mobile. Following the selection of a player, there will be a simultaneous Live Event where you can play as that player as soon as possible! Rookies can also be earned through completing Sets and in special packs. Following the Top 10 NFL players, the last of the first round will be entered into the game on Friday (4/28). 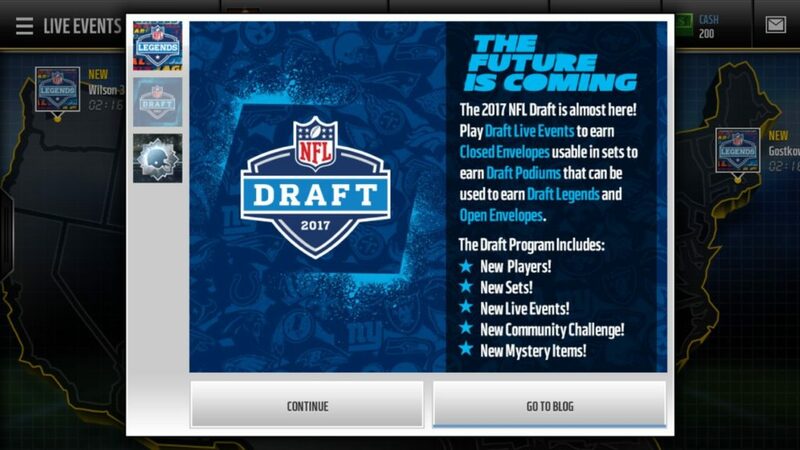 During the NFL Draft Program, Live Events and Packs will include “closed envelopes”. The way that this will work is you can then trade the closed envelopes in for podiums, which can then be traded for open envelopes which will correspond to one of the Top 10 Picks of the NFL Draft. It has been stated also that open envelopes will be able to be listed on the Auction Houses, but those from closed envelopes will not. There’ll be even more surprises in store throughout the Draft, so make sure you’re set up for an awesome night of football and entertainment on your phone too! Get that winning team for yourself. Need extra coins to grab your favourites from the Auction Houses? Get them here!